"Snakes... why did it have to be snakes?" Oh Indy! He's so brave, even the face of things he hate, like snakes. But whether Indy is battling crazy, evil Nazis or... well, it's usually Nazis, isn't it? Sure there was that time in India, but that was really more accidental than anything else. Besides, the Nazis all got their faces melted off and it's kind of hard to forget something like that. Yes, Indy is quite the hero, and whether he's paling around with Sallah, studying with Brody, or sneaking some romantic moments with Marion, he's always got his most trusted sidekick, his fedora (You thought we were going to say it was the whip, didn't you? Yes, the whip is cool too.)! 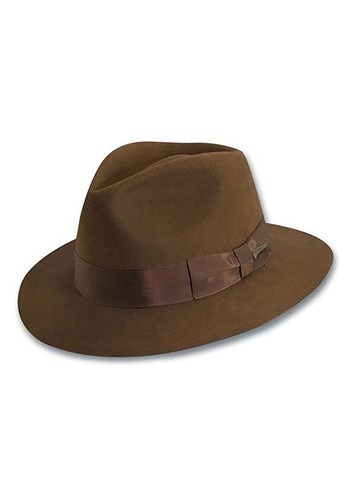 So now put on the mantle of the world's greatest archaeologist (or at least the most handsome) by placing his authentic hat on your authentic head. Once you're geared up, head out on adventures for forgotten idols, legends, and artifacts. Face danger, and live to tell the tale. And many years from now, once your adventures are done, you'll know the only place this hat should be: "It belongs in a museum!"